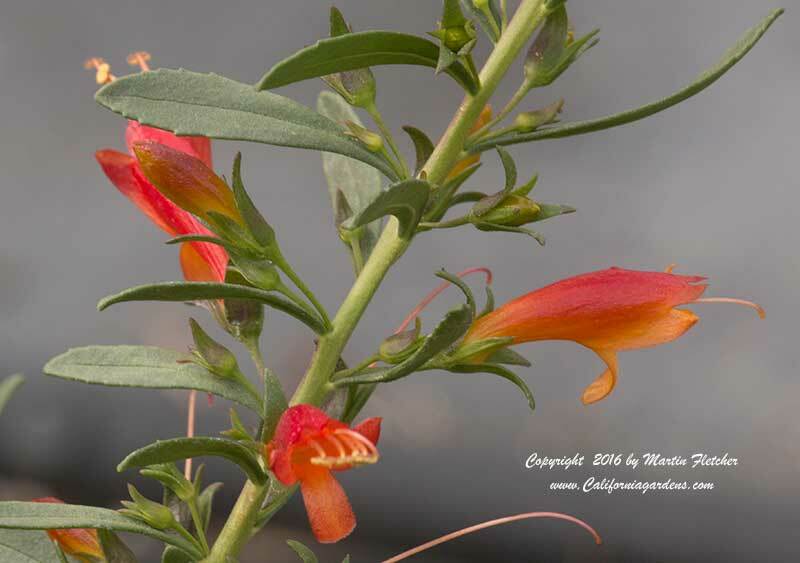 Eremophila glabra carnosa Winter Blaze blooms nearly all year. This Emu Bush grows to 4 feet tall and somewhat wider. The long tubular flowers make this is a great addition to the Hummingbird Garden. Eremophila glabra carnosa Winter Blaze is a potential larval food source for the Common Buckeye Butterfly and could be a nice addition to your butterfly garden. Eremophila glabra carnosa Winter Blaze is not particular about soil, heat, irrigation or much else. This Emu Bush is native to Western Australia. Plants are reportedly hardy to 20°F though if other selections of this species are any indication it will be able to withstand colder temperatures into the mid teens. Red flowers of Eremophila glabra carnosa Winter Blaze - Emu Bush. High resolution photos are part of our garden image collection.